Photo Andy Sheppard (Low Light Photo) at EFG London Jazz Festival 2013. 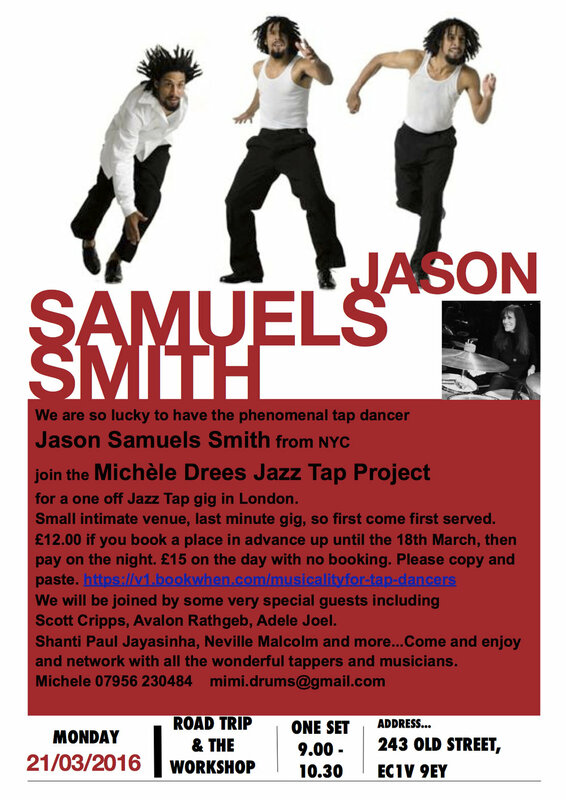 I am delighted that we have had such incredible Tap Masters come and dance with us. My aim is to be as sensitive as possible to tap dancers needs, to create together, to blow the lid off what is expected. To also forge a stronger tie with all tap dancers around the globe and to bring Rhythm Tap back into the International Jazz Festivals accompanied by some challenging incredible music. Setting up gigs and workshops on the London jazz scene for all visiting masters of this amazing craft. Junior Laniyan and Michele from the MDJTP were invited to perform at the incredible Stockholm Tap Festival in 2017. Lisa La Touche, Michela Marino Lerman, Josh Hilberman. EFG London Jazz Festival at the Purcell room Nov 18th 2013. Special guest star from New York the incredible Tap Master ANDREW NEMR. Michele Drees. Drum kit Shanti Paul Jayasinha Trumpet John Crawford Piano Steve Rose Double Bass.